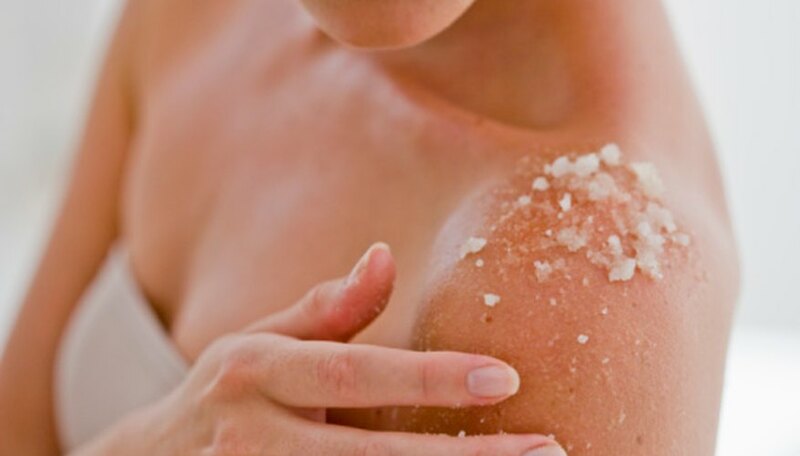 Epsom salt, the same product that helps to exfoliate your skin and soothe sore muscles, may also provide benefits for your plants. The white crystal-like substance contains magnesium sulfate. Many gardeners swear that giving their plants a good dose of Epsom salt helps them to grow big, beautiful flowers and a bountiful harvest. Despite a lack of scientific evidence, some gardeners insist Epsom salt also keeps some pests at bay. Create an Epsom salt solution and spray it on your plants, vegetable crop or lawn to deter pests. Add 1 cup of Epsom salt to 5 gallons of water and dissolve thoroughly; pour the solution into a pump sprayer and apply it to plant foliage. The solution helps keep slugs, which are burned by the salt, out of your garden and banish pests like beetles from your rose bushes. You can also handpick bugs and drown them in a bucket of the Epsom salt and water mixture. Sprinkle Epsom salt around the base of plants to provide a pest control barrier and a nutritional boost. For roses, tomatoes and other flowering plants apply 1 tbsp. of Epsom salt for each foot of plant height; reapply every two weeks. Add Epsom salt in the row when planting vegetable seeds to deter voles, potato bugs and other burrowing pests. Use Epsom salt to repel pests in your yard by applying 3 pounds of the mineral for every 1,250 square feet of lawn. If you are having problems indoors with pests like roaches create a bait bowl. Set out a saucer or shallow bowl full of Epsom salt. Ensure the roaches have access to the dish by placing wooden strips like craft sticks from the floor to the edge of the dish. The roaches will climb the sticks and eat the Epsom salt, which is toxic to those pests. The magnesium sulfate disturbs their system, keeps them from eating and eventually kills them. Give your plants a dose of Epsom salt even if they are not bothered by pests. The magnesium sulfate will help your plants grow up strong and stay healthy so they can ward off insects; healthy plants are less likely to suffer severe damage when attacked by garden pests. Epsom salt provides a nutritional boost for seed starting, so add it to the rows when planting. Application of Epsom salt may also prevent some plant diseases, such as blight. Rota L. Knott is a journalist with more than 20 years of experience covering everything from gardening to government. She has written for newspapers such as "Ocean Pines Progress," "Ocean City Today" and the "Ocean Pines Independent," as well as "Maryland Farmer" and "Pennsylvania Farmer" magazines. Knott received a Bachelor of Arts in communications from Salisbury State University in Salisbury, Md.